Movie lovers were understandably sad that the great character actor Dennis Farina died last year. Movie lovers SHOULD be royally ticked off that the great character actor Dennis Farina was apparently spending the twilight of his career appearing in dreck like "Authors Anonymous," which according to varied sources on the Internet, was his second-to-last movie. 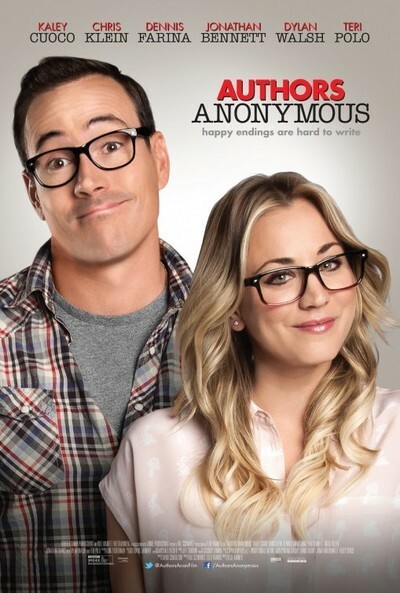 As the title for this remarkably limp and obvious ensemble comedy suggests, "Author’s Anonymous" is about a writers’ group. That is to say, a group of wannabe scribes who meet together and workshop/critique each other’s works, each member nurturing, if not outright milking dry, the hope of finding representation, publication, and best sellerdom. First-time-credited screenwriter David Congalton, ignoring the rule about how if one wants to make fun of the aspirations of other writers, one ought to check oneself and one’s talent pretty mercilessly before even setting down word one, peoples this group (set in the literary hotbed of Los Angeles) with exceptionally predictable types. Farina plays a tough-guy Tom Clancy wannabe. Chris Klein’s a Fitzgerald devotee who’s also a pizza delivery boy. Teri Polo’s a flighty Danielle Steel wannabe, I think; Dylan Walsh is her optometrist husband who’s Polo’s top enabler. Jonathan Bennet’s a Bukowski wannabe—sample dialogue, or rather monologue, because, cleverly enough, "Authors Anonymous" indifferently adopts the conceit of being a “documentary” about its characters: “I am here because of Bukowski. Charles Bukowski. Greatest writer ever. Period. L.A. is his town, man. If I’m gonna be a writer, you know, I’ve gotta walk in Bukowski’s shoes, man.” (So, see, setting the movie in Los Angeles really DOES make sense.) And Kaley Cuoco of "The Big Bang Theory" fame and Internet shut-in lust plays an airhead who’s never heard of Jane Austen. So guess which member of the group gets an agent and a book deal and a six-figure movie deal? If you guessed, you really don’t need to see this movie. If you didn’t, you really don’t need to see this movie. Seriously. The scene depicting a book signing at a hardware store seemed, to me, this movie’s peak bottom, if you will, but by that point the picture still had 45 minutes to go. Farina’s talent is thrown away here; Cuoco is funnier on her sitcom; Klein and Polo you just kind of feel bad for. Hence, the only reason to watch this picture is for the novelty value of feeling bad for Chris Klein and/or Teri Polo. To each his own, but my recommendation is "pass."